It all started my freshman year at Stanford when I decided to study electrical engineering. I had heard it was the most challenging major at school and I happened to be good at math and science so I decided to go for it. At school, the engineering coursework was demanding and I struggled at times, but I loved being able to build things and solve problems. Growing up, I often spent time with my dad in the garage tinkering and building things with him. It’s no surprise that I found my passion in technology, in particular mobile technology and decided I would base my career on it. Upon graduating Stanford, I found an opportunity at a Swedish telecommunications company called Ericsson to start working on a technology called Bluetooth. I was supposed to fly to Stockholm on 9/11, 2001, but that didn’t happen. The terrorist attacks happened that morning and my plane was grounded and it would be months before I’d be able to make it out again. When planes were finally allowed to fly again, I went and after multiple interviews they offered me a job as an application engineer, based in Sweden. I spent two years in Stockholm and learned conversational Swedish and how to become an adult in a totally foreign country. At work I was the only female and non-Swedish person on my team so I really had to #LeanIn to prove myself and gain the respect of my peers. Then our division got acquired by Infineon Technologies, a German company, and I had the opportunity to move to Shanghai to build their Bluetooth business there. Working in mobile in Shanghai was eye opening, but one day I saw that Apple was getting into the mobile business. Two of my biggest passions were mobile and music and I managed to get connected with the right person at Apple. They liked my deep mobile background so much that they created a position for me and I was the first mobile product hire on the iTunes team. My time at Apple was pivotal because that’s where I learned about building great consumer products, digital media, and the importance of building strong company culture. It would be the foundation for later when I would start my first company. In 2011, I decided to take the entrepreneurial plunge. Before that, I had left Apple to attend HBS, and then joined Palm as their messaging product manager for webOS. When I started my company Afolio, there was no Women 2.0 or a platform like Lean In. There were very few female founder/CEOs back then and I was navigating this new world with just an idea and the passion to want to build the next Apple or Amazon. When I started my company, I was dating this wonderful man and we fell in love and he happened to be an entrepreneur as well. He was extremely supportive of my entrepreneurial dreams and I knew he was the one for me. We got engaged in Dec 2010 and then married in Aug 2011 in France, where he is from. 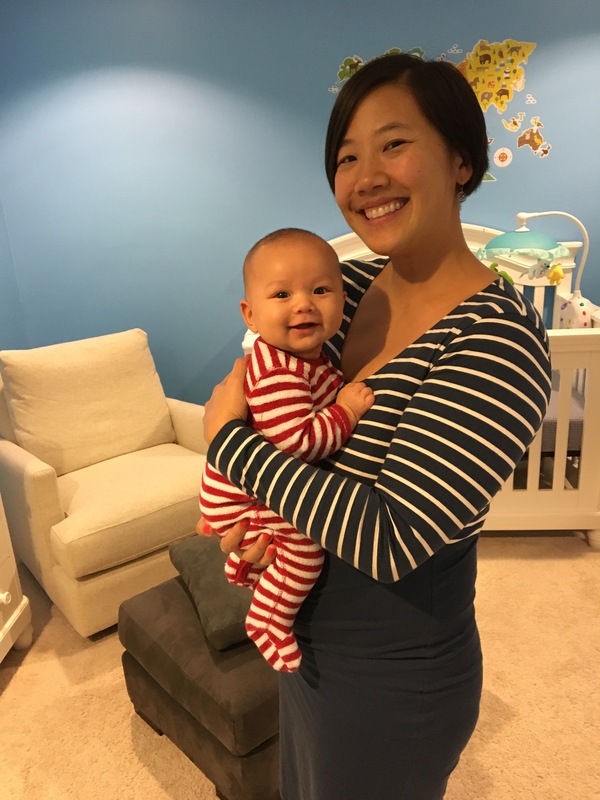 I raised a small seed round of funding and continued to build the company and then things changed when I found out I was pregnant in March 2012. I vowed to myself that I would continue my company and after my first son was born, I only took 2 weeks of maternity leave. At this point my company was just contractors and we’d shipped an iOS app. The initial company was focused around solving the problem of gathering photos from multiple people and devices in one place, but the photo space was difficult to monetize. I needed to think fast and come up with a new direction. Luckily I discovered that my life as a displaced sports fan (Stanford football, Stanford basketball, the Warriors, the Giants, the 49ers living outside the Bay Area) was not unusual and I uncovered a large market opportunity for a sports-based community for mobile and web. So I pivoted the business and rebuilt my team from scratch. I recruited a technical lead from Zynga, another senior engineer from Adap.TV and a content lead from ESPN, NFL and MLB. I also recruited Ronnie Lott, four-time Super Bowl champion and NFL Hall of Fame to join as one of our advisors. We officially launched the FanTalk iOS app in Sep 2015 and then our web app in Oct 2015. Then just a few months ago, in Dec 2015, I gave birth to my second son, Thibaut. Holding my happy little guy. Growing up, my mom and dad always taught me that the sky’s the limit and that I can accomplish anything I set my mind to. Even as an adult I try to always put this into practice. I’m also trying to pass it on to my children. My oldest son is only three years old, so it doesn’t always stick, but there are moments when I see that my efforts are paying off. My mother was also a working mom and in between working, she drove my sister and I to school, gymnastics practice and other activities. My father is a serial entrepreneur who started his first company because there was a glass ceiling for him and he moved to America as a poor immigrant from China to live the American dream. I’m fortunate that I have a strong support network and rely heavily on my amazing husband, parents and friends to help me nurture both my business and my two children. It truly does take a village. People say to me sometimes, “Wow, you’re a tech entrepreneur and a mother of two, you’re superwoman!” My first reaction whenever I hear this is at first I’m flattered, but then immediately following I’m surprised. There are so many working mothers that have to do what I do, so I don’t see it as unique. But then I always remind the person that “I could not do what I do without a really strong support network.” In particular, I have an amazing husband. He’s my rock. We both have pretty high demands on our career, but we make it work and we both pitch in at home, and can talk with each other about work since he’s also an entrepreneur. Entrepreneurship is such an emotional roller coaster that having someone at home that understands and can relate to what I’m going through is tremendous. My mom has also helped a ton – from picking up my oldest from school a few days a week to watching my oldest son for a couple weeks with my dad when we just had our newborn. My father has also been an invaluable resource with my company, as an entrepreneur himself. My younger sister also helps remind me to watch out for my health because I’m always so go-go-go that she knows me well enough that I need to hear that kind of thing. She also has two kids, and her son is just a few months younger than my oldest and the two boys are wonderful together. When I look at my life, I see myself as a lifelong learner, a tech entrepreneur, an educated citizen, a former competitive athlete, a wife, and a mother. Although I was a former SI Face in the Crowd and had aspirations to compete in the Olympic Games, my life took a different path. It’s a path that has been anything but “normal” and that’s because I chose to #LeanIn so many times. I’ve created my own opportunities with the help of some amazing people. However, I do realize that there are still more challenges ahead for women in the technology sector. And even more so for female entrepreneurs. None of the top technology companies (e.g. Facebook, Google, Apple, Amazon) have ever acquired a company with a female founder/CEO. I’d like to help change that and show other women what is possible. If you like my story and would like to help me succeed as an entrepreneur, please do sign up for FanTalk on iOS or web and spread the word. Thank you!